Yesterday was a productive day. I woke up, got ready and then went on to pay my road tax, take my dog to the vets, visit to the bank, and buy myself a little treat online. After that I'd gone on to eat a naughty McDonald's for lunch and fall asleep on the sofa for about an hour before waking up, watching Britain's Got Talent and staying up late watching Jurrasic Park... T'was a good activity filled day! 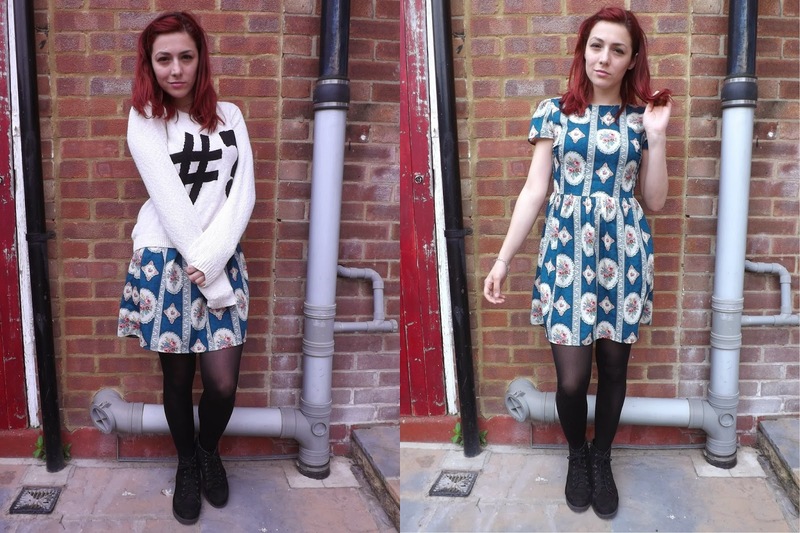 Yesterday I decided to wear this cute tea dress I bought in Primark around Christmas time. I love the colour, mostly because it completely contrasts my hair. The print is adorable and I feel like a little doll in this dress! I wasn't feeling the idea of a cardigan, though it was warm outside but still quite windy, so I settled to wearing a jumper on top instead. This jumper is unbelievably comfortable, and the "hash tag - question mark" appeals to my internet personality a lot! It makes me think, what hash tag suits today? And yesterday was #teadress. Hope you're all having a lovely weekend!